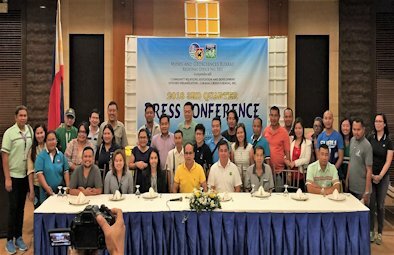 The Philippine Information Agency Caraga Regional Office and reporters from Surigao del Norte media outfits along with Resident Mine Managers, Community Relations Officers and a good number of personnel from Caraga mining companies took part in the activity. Regional Director Roger A. De Dios delivered the Welcome Remarks. In his message, he expressed that the industry is one with the nation in facing the sad scenarios of landslide incidents in Itogon, Benguet and Naga City, Cebu. Dir. De Dios stated that the recent DENR and MGB issuances of Administrative Orders and Memorandum Circulars are crucial to the improvement of the minerals industry’s policies and guidelines. As a final point, he emphasized that the full cooperation of each and everyone in the minerals industry including the media is needed for the enforcement of these laws. Engr. Brenice Ann M. Gendeve-Castillo, Engineer IV/Chief of MGB RXIII Monitoring and Technical Services Section, presented Recent Mining Policy Issuances and Directions. In the same way, Engr. Corsino L. Odtojan, PGMC Vice President for Operations, gave a presentation on the Temporary Revegetation Plan of Platinum Group Metals Corporation. Lastly, Engr. Verlin Marie M. Baldapan, Engineer IV/Chief of MGB RXIII Mining Tenements Evaluation Section, presented the National Task Force Mining Challenge (NTFMC) – Caraga Region Accomplishment Report. After the presentations, reporters from Surigao del Norte media outfits asked questions and raised various issues during the Question and Answer Session facilitated by Ms. Susil D. Ragas, Provincial Coordinator of Surigao del Norte and Province of Dinagat Islands Information Center, who acted as the moderator. Towards the end of the press conference, a brief interaction between the media practitioners and the mining stakeholders took place.